Here you will find a wide variety of X-cart Admin Product Tools to help you manage your products and product data. The Drop Shipping Mod is for stores that have different shippers for different products. The PRO version includes shipping calculations per drop shipper's location. The long awaited mod is here! Allow your customers the ability to preorder or backorder your products! Great for stores that sell pre-released items or want customers to buy items expected to be back in stock! 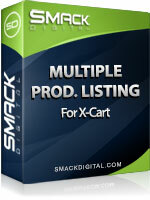 Multiple Product Listing (Category) Templates for X-Cart allows you to create unlimited custom product listing templates, and display your products using an appropriate layout by selecting it from a drop-down menu on the category add/modify page.